Simulation of the collision of two black holes. In addition to forming deep gravity wells and coalescing into a single larger black hole, gravitational waves will propagate outwards as the black holes spin past each other. In 1993, Russell A. Hulse and Joseph H. Taylor, Jr. received the Nobel Prize in Physics for the discovery and observation of the Hulse-Taylor binary pulsar, which offered the first indirect evidence of the existence of gravitational waves. On 11 February 2016, the LIGO and Virgo Scientific Collaboration announced they had made the first direct observation of gravitational waves. The observation was made five months earlier, on 14 September 2015, using the Advanced LIGO detectors. The gravitational waves originated from a pair of merging black holes. After the initial announcement the LIGO instruments detected two more confirmed, and one potential, gravitational wave events. In August 2017, the two LIGO instruments and the Virgo instrument observed a fourth gravitational wave from merging black holes, and a fifth gravitational wave from a binary neutron star merger. Several other gravitational wave detectors are planned or under construction. In 2017, the Nobel Prize in Physics was awarded to Rainer Weiss, Kip Thorne and Barry Barish for their role in the direct detection of gravitational waves. As a gravitational wave passes an observer, that observer will find spacetime distorted by the effects of strain. Distances between objects increase and decrease rhythmically as the wave passes, at a frequency equal to that of the wave. This occurs despite such free objects never being subjected to an unbalanced force. The magnitude of this effect decreases in proportion to the inverse distance from the source. :227 Inspiraling binary neutron stars are predicted to be a powerful source of gravitational waves as they coalesce, due to the very large acceleration of their masses as they orbit close to one another. However, due to the astronomical distances to these sources, the effects when measured on Earth are predicted to be very small, having strains of less than 1 part in 1020. Scientists have demonstrated the existence of these waves with ever more sensitive detectors. The most sensitive detector accomplished the task possessing a sensitivity measurement of about one part in 7022499999999999999♠5×1022 (as of 2012[update]) provided by the LIGO and VIRGO observatories. 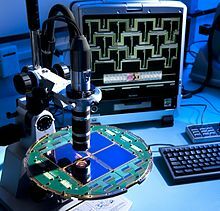 A space based observatory, the Laser Interferometer Space Antenna, is currently under development by ESA. The possibility of gravitational waves was discussed in 1893 by Oliver Heaviside using the analogy between the inverse-square law in gravitation and electricity. In 1905, Henri Poincaré proposed gravitational waves, emanating from a body and propagating at the speed of light, as being required by the Lorentz transformations and suggested that, in analogy to an accelerating electrical charge producing electromagnetic waves, accelerated masses in a relativistic field theory of gravity should produce gravitational waves. When Einstein published his general theory of relativity in 1915, he was skeptical of Poincaré's idea since the theory implied there were no "gravitational dipoles". Nonetheless, he still pursued the idea and based on various approximations came to the conclusion there must, in fact, be three types of gravitational waves (dubbed longitudinal-longitudinal, transverse-longitudinal, and transverse-transverse by Hermann Weyl). The oscillations depicted in the animation are exaggerated for the purpose of discussion – in reality a gravitational wave has a very small amplitude (as formulated in linearized gravity). However, they help illustrate the kind of oscillations associated with gravitational waves as produced by a pair of masses in a circular orbit. In this case the amplitude of the gravitational wave is constant, but its plane of polarization changes or rotates at twice the orbital rate, so the time-varying gravitational wave size, or 'periodic spacetime strain', exhibits a variation as shown in the animation. If the orbit of the masses is elliptical then the gravitational wave's amplitude also varies with time according to Einstein's quadrupole formula. Amplitude: Usually denoted h, this is the size of the wave – the fraction of stretching or squeezing in the animation. The amplitude shown here is roughly h = 0.5 (or 50%). Gravitational waves passing through the Earth are many sextillion times weaker than this – h ≈ 10−20. A spinning non-axisymmetric planetoid – say with a large bump or dimple on the equator – will radiate. Gravitational waves carry energy away from their sources and, in the case of orbiting bodies, this is associated with an in-spiral or decrease in orbit. Imagine for example a simple system of two masses – such as the Earth–Sun system – moving slowly compared to the speed of light in circular orbits. Assume that these two masses orbit each other in a circular orbit in the x–y plane. To a good approximation, the masses follow simple Keplerian orbits. However, such an orbit represents a changing quadrupole moment. That is, the system will give off gravitational waves. The sources of gravitational waves described above are in the low-frequency end of the gravitational-wave spectrum (10−7 to 105 Hz). An astrophysical source at the high-frequency end of the gravitational-wave spectrum (above 105 Hz and probably 1010 Hz) generates[clarification needed] relic gravitational waves that are theorized to be faint imprints of the Big Bang like the cosmic microwave background. At these high frequencies it is potentially possible that the sources may be "man made" that is, gravitational waves generated and detected in the laboratory. Although the waves from the Earth–Sun system are minuscule, astronomers can point to other sources for which the radiation should be substantial. One important example is the Hulse–Taylor binary – a pair of stars, one of which is a pulsar. The characteristics of their orbit can be deduced from the Doppler shifting of radio signals given off by the pulsar. Each of the stars is about 1.4 M☉ and the size of their orbits is about 1/75 of the Earth–Sun orbit, just a few times larger than the diameter of our own Sun. The combination of greater masses and smaller separation means that the energy given off by the Hulse–Taylor binary will be far greater than the energy given off by the Earth–Sun system – roughly 1022 times as much. A simple device theorised to detect the expected wave motion is called a Weber bar – a large, solid bar of metal isolated from outside vibrations. This type of instrument was the first type of gravitational wave detector. Strains in space due to an incident gravitational wave excite the bar's resonant frequency and could thus be amplified to detectable levels. Conceivably, a nearby supernova might be strong enough to be seen without resonant amplification. With this instrument, Joseph Weber claimed to have detected daily signals of gravitational waves. His results, however, were contested in 1974 by physicists Richard Garwin and David Douglass. Modern forms of the Weber bar are still operated, cryogenically cooled, with superconducting quantum interference devices to detect vibration. Weber bars are not sensitive enough to detect anything but extremely powerful gravitational waves. A more sensitive class of detector uses laser interferometry to measure gravitational-wave induced motion between separated 'free' masses. This allows the masses to be separated by large distances (increasing the signal size); a further advantage is that it is sensitive to a wide range of frequencies (not just those near a resonance as is the case for Weber bars). After years of development the first ground-based interferometers became operational in 2015. Currently, the most sensitive is LIGO – the Laser Interferometer Gravitational Wave Observatory. LIGO has three detectors: one in Livingston, Louisiana, one at the Hanford site in Richland, Washington and a third (formerly installed as a second detector at Hanford) that is planned to be moved to India. Each observatory has two light storage arms that are 4 kilometers in length. These are at 90 degree angles to each other, with the light passing through 1 m diameter vacuum tubes running the entire 4 kilometers. A passing gravitational wave will slightly stretch one arm as it shortens the other. This is precisely the motion to which an interferometer is most sensitive. Interferometric detectors are limited at high frequencies by shot noise, which occurs because the lasers produce photons randomly; one analogy is to rainfall – the rate of rainfall, like the laser intensity, is measurable, but the raindrops, like photons, fall at random times, causing fluctuations around the average value. This leads to noise at the output of the detector, much like radio static. In addition, for sufficiently high laser power, the random momentum transferred to the test masses by the laser photons shakes the mirrors, masking signals of low frequencies. Thermal noise (e.g., Brownian motion) is another limit to sensitivity. In addition to these 'stationary' (constant) noise sources, all ground-based detectors are also limited at low frequencies by seismic noise and other forms of environmental vibration, and other 'non-stationary' noise sources; creaks in mechanical structures, lightning or other large electrical disturbances, etc. may also create noise masking an event or may even imitate an event. All these must be taken into account and excluded by analysis before detection may be considered a true gravitational wave event. On 16 October 2017, the LIGO and Virgo collaborations announced the first ever detection of gravitational waves originating from the coalescence of a binary neutron star system. The observation of the GW170817 transient, which occurred on 17 August 2017, allowed for constraining the masses of the neutron stars involved between 0.86 and 2.26 solar masses. Further analysis allowed a greater restriction of the mass values to the interval 1.17–1.60 solar masses, with the total system mass measured to be 2.73–2.78 solar masses. The inclusion of the Virgo detector in the observation effort allowed for an improvement of the localization of the source by a factor of 10. This in turn facilitated the electromagnetic follow-up of the event. In contrast to the case of binary black hole mergers, binary neutron star mergers were expected to yield an electromagnetic counterpart, that is, a light signal associated with the event. A gamma-ray burst (GRB 170817A) was detected by the Fermi Gamma-ray Space Telescope, occurring 1.7 seconds after the gravitational wave transient. The signal, originating near the galaxy NGC 4993, was associated with the neutron star merger. This was corroborated by the electromagnetic follow-up of the event (AT 2017gfo), involving 70 telescopes and observatories and yielding observations over a large region of the electromagnetic spectrum which further confirmed the neutron star nature of the merged objects and the associated kilonova. In Liu Cixin's Remembrance of Earth's Past series, gravitational waves are used as an interstellar broadcast signal, which serves as a central plot point in the conflict between civilizations within the galaxy. ^ a b Einstein, A (1918). "Über Gravitationswellen". Sitzungsberichte der Königlich Preussischen Akademie der Wissenschaften Berlin. part 1: 154–167. Bibcode:1918SPAW.......154E. ^ Einstein, Albert; Rosen, Nathan (January 1937). "On gravitational waves". Journal of the Franklin Institute. 223 (1): 43–54. Bibcode:1937FrInJ.223...43E. doi:10.1016/S0016-0032(37)90583-0. ^ Nobel Prize Award (1993) Press Release The Royal Swedish Academy of Sciences. ^ a b c Castelvecchi, Davide; Witze, Witze (11 February 2016). "Einstein's gravitational waves found at last". Nature News. doi:10.1038/nature.2016.19361. Retrieved 2016-02-11. ^ a b c Abbott BP, et al. (LIGO Scientific Collaboration and Virgo Collaboration) (2016). "Observation of Gravitational Waves from a Binary Black Hole Merger". Physical Review Letters. 116 (6): 061102. arXiv:1602.03837. Bibcode:2016PhRvL.116f1102A. doi:10.1103/PhysRevLett.116.061102. PMID 26918975. ^ LIGO Scientific Collaboration and Virgo Collaboration (2016). "GW151226: Observation of Gravitational Waves from a 22-Solar-Mass Binary Black Hole Coalescence". Physical Review Letters. 116 (24): 241103. arXiv:1606.04855. Bibcode:2016PhRvL.116x1103A. doi:10.1103/PhysRevLett.116.241103. PMID 27367379. ^ Abbott, B. P; Abbott, R; Abbott, T. D; Acernese, F; Ackley, K; Adams, C; Adams, T; Addesso, P; Adhikari, R. X; Adya, V. B; Affeldt, C; Afrough, M; Agarwal, B; Agathos, M; Agatsuma, K; Aggarwal, N; Aguiar, O. D; Aiello, L; Ain, A; Ajith, P; Allen, B; Allen, G; Allocca, A; Altin, P. A; Amato, A; Ananyeva, A; Anderson, S. B; Anderson, W. G; Antier, S; et al. (2017). "GW170104: Observation of a 50-Solar-Mass Binary Black Hole Coalescence at Redshift 0.2". Physical Review Letters. 118 (22): 221101. arXiv:1706.01812. Bibcode:2017PhRvL.118v1101A. doi:10.1103/physrevlett.118.221101. PMID 28621973. ^ "European detector spots its first gravitational wave". 27 September 2017. Retrieved 27 September 2017. ^ a b Abbott BP, et al. (LIGO Scientific Collaboration & Virgo Collaboration) (16 October 2017). "GW170817: Observation of Gravitational Waves from a Binary Neutron Star Inspiral". Physical Review Letters. 119 (16): 161101. arXiv:1710.05832. Bibcode:2017PhRvL.119p1101A. doi:10.1103/PhysRevLett.119.161101. PMID 29099225. ^ "The Newest Search for Gravitational Waves has Begun". LIGO Caltech. LIGO. 18 September 2015. Retrieved 29 November 2015. ^ a b Rincon, Paul; Amos, Jonathan (3 October 2017). "Einstein's waves win Nobel Prize". BBC News. Retrieved 3 October 2017. ^ a b Overbye, Dennis (3 October 2017). "2017 Nobel Prize in Physics Awarded to LIGO Black Hole Researchers". The New York Times. Retrieved 3 October 2017. ^ a b Kaiser, David (3 October 2017). "Learning from Gravitational Waves". The New York Times. Retrieved 3 October 2017. ^ Bernard Schutz (14 May 2009). A First Course in General Relativity. Cambridge University Press. ISBN 978-0-521-88705-2. ^ LIGO Scientific Collaboration; Virgo Collaboration (2012). "Search for Gravitational Waves from Low Mass Compact Binary Coalescence in LIGO's Sixth Science Run and Virgo's Science Runs 2 and 3". Physical Review D. 85 (8): 082002. arXiv:1111.7314. Bibcode:2012PhRvD..85h2002A. doi:10.1103/PhysRevD.85.082002. ^ Krauss, LM; Dodelson, S; Meyer, S (2010). "Primordial Gravitational Waves and Cosmology". Science. 328 (5981): 989–992. arXiv:1004.2504. Bibcode:2010Sci...328..989K. doi:10.1126/science.1179541. PMID 20489015. ^ a b Hawking, S. W.; Israel, W. (1979). General Relativity: An Einstein Centenary Survey. Cambridge: Cambridge University Press. p. 98. ISBN 978-0-521-22285-3. ^ a b c Staff (17 March 2014). "BICEP2 2014 Results Release". National Science Foundation. Retrieved 18 March 2014. ^ a b c Clavin, Whitney (17 March 2014). "NASA Technology Views Birth of the Universe". NASA. Retrieved 17 March 2014. ^ Overbye, Dennis (17 March 2014). "Detection of Waves in Space Buttresses Landmark Theory of Big Bang". New York Times. Retrieved 17 March 2014. ^ (PDF) Membres de l'Académie des sciences depuis sa création : Henri Poincare. Sur la dynamique de l' electron. Note de H. Poincaré. C.R. T.140 (1905) 1504–1508. ^ a b c d e f g Cervantes-Cota, J.L. ; Galindo-Uribarri, S.; Smoot, G.F. (2016). "A Brief History of Gravitational Waves". Universe. 2 (3): 22. arXiv:1609.09400. Bibcode:2016Univ....2...22C. doi:10.3390/universe2030022. ^ a b Daniel Kennefick (29 March 2016). Traveling at the Speed of Thought: Einstein and the Quest for Gravitational Waves. Princeton University Press. ISBN 978-1-4008-8274-8. ^ a b Taylor, J. H.; Fowler, L. A.; McCulloch, P. M. (1979). "Overall measurements of relativistic effects in the binary pulsar PSR 1913 + 16". Nature. 277: 437–440. Bibcode:1982ApJ...253..908T. doi:10.1086/159690. ^ Taylor, J.; Weisberg, J.M. (1979). "A New Test of General Relativity: Gravitational Radiation and the Binary Pulsar PSR 1913+16". Astrophysical Journal. 253 (5696): 908–920. Bibcode:1979Natur.277..437T. doi:10.1038/277437a0. ^ Gertsenshtein, M. E.; Pustovoit, V. I. (1962). "On the detection of low frequency gravitational waves". JETP. 43: 605–607. ^ Clara Moskowitz (17 March 2014). "Gravity Waves from Big Bang Detected". Scientific American. Retrieved 21 March 2016. ^ Ian Sample. "Gravitational waves turn to dust after claims of flawed analysis". the Guardian. ^ Landau, L. D.; Lifshitz, E. M. (1975). The Classical Theory of Fields (Fourth Revised English ed.). Pergamon Press. pp. 356–357. ISBN 978-0-08-025072-4. ^ "Gravitational Astrophysics Laboratory". science.gsfc/nasa.gov. Retrieved 20 September 2016. ^ a b "Wayback Machine" (PDF). 29 January 2016. ^ "ESO Telescopes Observe First Light from Gravitational Wave Source - Merging neutron stars scatter gold and platinum into space". www.eso.org. Retrieved 18 October 2017. ^ "Neutron Star Crust Is Stronger than Steel". Retrieved 2016-07-01. ^ Merritt, D.; et al. (May 2004). "Consequences of Gravitational Wave Recoil". The Astrophysical Journal Letters. 607 (1): L9–L12. arXiv:astro-ph/0402057. Bibcode:2004ApJ...607L...9M. doi:10.1086/421551. ^ Gualandris A, Merritt D, et al. (May 2008). "Ejection of Supermassive Black Holes from Galaxy Cores". The Astrophysical Journal. 678 (2): 780–797. arXiv:0708.0771. Bibcode:2008ApJ...678..780G. doi:10.1086/586877. ^ Merritt, D.; Schnittman, J. D.; Komossa, S. (2009). "Hypercompact Stellar Systems Around Recoiling Supermassive Black Holes". The Astrophysical Journal. 699 (2): 1690–1710. arXiv:0809.5046. Bibcode:2009ApJ...699.1690M. doi:10.1088/0004-637X/699/2/1690. ^ Komossa, S.; Zhou, H.; Lu, H. (May 2008). "A Recoiling Supermassive Black Hole in the Quasar SDSS J092712.65+294344.0?". The Astrophysical Journal. 678 (2): L81–L84. arXiv:0804.4585. Bibcode:2008ApJ...678L..81K. doi:10.1086/588656. ^ For a comparison of the geometric derivation and the (non-geometric) spin-2 field derivation of general relativity, refer to box 18.1 (and also 17.2.5) of Misner, C. W.; Thorne, K. S.; Wheeler, J. A. (1973). Gravitation. W. H. Freeman. ISBN 978-0-7167-0344-0. ^ Lightman, A. P.; Press, W. H.; Price, R. H.; Teukolsky, S. A. (1975). "Problem 12.16". Problem book in Relativity and Gravitation. Princeton University Press. ISBN 978-0-691-08162-5. ^ Berry, Christopher (14 May 2015). "Listening to the gravitational universe: what can't we see?". University of Birmingham. University of Birmingham. Retrieved 29 November 2015. ^ Mack, Katie (2017-06-12). "Black Holes, Cosmic Collisions and the Rippling of Spacetime". The Atlantic. ^ Braginsky, V. B., Rudenko and Valentin, N. Section 7: "Generation of gravitational waves in the laboratory", Physics Report (Review section of Physics Letters), 46, No. 5. 165–200, (1978). ^ Li, Fangyu, Baker, R. M L, Jr., and Woods, R. C., "Piezoelectric-Crystal-Resonator High-Frequency Gravitational Wave Generation and Synchro-Resonance Detection", in the proceedings of Space Technology and Applications International Forum (STAIF-2006), edited by M.S. El-Genk, AIP Conference Proceedings, Melville NY 813: 2006. ^ Wall, SPACE.com, Mike. "Gravitational Waves Send Supermassive Black Hole Flying". Scientific American. Retrieved 2017-03-27. ^ Chiaberge, M.; Ely, J. C.; Meyer, E. T.; Georganopoulos, M.; Marinucci, A.; Bianchi, S.; Tremblay, G. R.; Hilbert, B.; Kotyla, J. P. (2016-11-16). "The puzzling case of the radio-loud QSO 3C 186: a gravitational wave recoiling black hole in a young radio source?". Astronomy & Astrophysics. 600: A57. arXiv:1611.05501. Bibcode:2017A&A...600A..57C. doi:10.1051/0004-6361/201629522. ^ a b Cowen, Ron (2015-01-30). "Gravitational waves discovery now officially dead". nature. doi:10.1038/nature.2015.16830. ^ The LIGO Scientific Collaboration; the Virgo Collaboration (2004). "Relativistic Binary Pulsar B1913+16: Thirty Years of Observations and Analysis". Binary Radio Pulsars. 328: 25. arXiv:astro-ph/0407149. Bibcode:2005ASPC..328...25W. ^ Taylor, J. H.; Weisberg, J. M. (1979). "A New Test of General Relativity: Gravitational Radiation and the Binary Pulsar PSR 1913+16". Astrophysical Journal. 253 (5696): 908–920. Bibcode:1979Natur.277..437T. doi:10.1038/277437a0. ^ Huang, Y.; Weisberg, J. M. (2016). "Relativistic Measurements from Timing the Binary Pulsar PSR B1913+16". Astrophysical Journal. 829 (1): 55. arXiv:1606.02744. Bibcode:2016ApJ...829...55W. doi:10.3847/0004-637X/829/1/55. ^ "Nobel Prizes and Laureates - NobelPrize.org". NobelPrize.org. ^ Damour, Thibault (2015). "1974: the discovery of the first binary pulsar". Classical and Quantum Gravity. 32 (12): 124009. arXiv:1411.3930. Bibcode:2015CQGra..32l4009D. doi:10.1088/0264-9381/32/12/124009. ^ "Noise and Sensitivity". gwoptics: Gravitational wave E-book. University of Birmingham. Retrieved 10 December 2015. ^ Thorne, Kip S. (1995). "Gravitational Waves". Particle and Nuclear Astrophysics and Cosmology in the Next Millenium: 160. arXiv:gr-qc/9506086. Bibcode:1995pnac.conf..160T. ^ Blair DG, ed. (1991). 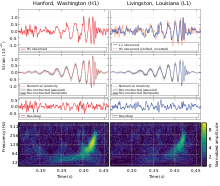 The detection of gravitational waves. Cambridge University Press. ^ For a review of early experiments using Weber bars, see Levine, J. (April 2004). "Early Gravity-Wave Detection Experiments, 1960–1975". Physics in Perspective. 6 (1): 42–75. Bibcode:2004PhP.....6...42L. doi:10.1007/s00016-003-0179-6. ^ De Waard, A.; Gottardi, L.; Frossati, G. (2006). "MiniGRAIL, the first spherical gravitational wave detector". Recent Developments in Gravitational Physics: 415. Bibcode:2006rdgp.conf..415D. ^ de Waard, Arlette; Luciano Gottardi; Giorgio Frossati (July 2000). Spherical Gravitational Wave Detectors: cooling and quality factor of a small CuAl6% sphere. Marcel Grossmann meeting on General Relativity. Rome, Italy: World Scientific Publishing Co. Pte. Ltd. (published December 2002). pp. 1899–1901. Bibcode:2002nmgm.meet.1899D. doi:10.1142/9789812777386_0420. ISBN 9789812777386. ^ Cruise, Mike. "Research Interests". Astrophysics & Space Research Group. University of Birmingham. Retrieved 29 November 2015. ^ The idea of using laser interferometry for gravitational wave detection was first mentioned by Gerstenstein and Pustovoit 1963 Sov. Phys.–JETP 16 433. Weber mentioned it in an unpublished laboratory notebook. Rainer Weiss first described in detail a practical solution with an analysis of realistic limitations to the technique in R. Weiss (1972). "Electromagetically Coupled Broadband Gravitational Antenna". Quarterly Progress Report, Research Laboratory of Electronics, MIT 105: 54. ^ LIGO Scientific Collaboration; Virgo Collaboration (2010). "Predictions for the rates of compact binary coalescences observable by ground-based gravitational-wave detectors". Classical and Quantum Gravity. 27 (17): 17300. arXiv:1003.2480. Bibcode:2010CQGra..27q3001A. doi:10.1088/0264-9381/27/17/173001. ^ Hellings, R.W. ; Downs, G.S. (1983). "Upper limits on the isotropic gravitational radiation background from pulsar timing analysis". Astrophysical Journal Letters. 265: L39–L42. Bibcode:1983ApJ...265L..39H. doi:10.1086/183954. ^ Arzoumanian Z, et al. (NANOGrav Collaboration) (2018). "The NANOGrav 11-year Data Set: Pulsar-timing Constraints On The Stochastic Gravitational-wave Background". The Astrophysical Journal. 859 (1): 47. arXiv:1801.02617. Bibcode:2018ApJ...859...47A. doi:10.3847/1538-4357/aabd3b. ^ Hobbs, G.; et al. (2010). "The International Pulsar Timing Array project: using pulsars as a gravitational wave detector". Classical and Quantum Gravity. 27 (8): 084013. arXiv:0911.5206. Bibcode:2010CQGra..27h4013H. doi:10.1088/0264-9381/27/8/084013. ^ "This collision was 50 times more powerful than all the stars in the universe combined". ^ a b "LIGO's First-Ever Detection of Gravitational Waves Opens a New Window on the Universe". Wired. 2016-02-11. ^ "GW170817 Press Release". LIGO Lab | Caltech. Retrieved 2017-10-17. ^ ME Gerstenstein; VI Pustovoit (1962). "On the Detection of Low-Frequency Gravitational Waves". ZhETF (in Russian). 16 (8): 605–607. Bibcode:1963JETP...16..433G.